Being a parent and constantly having a child want your attention, climbing all over you and sometimes talking incessantly can really wear on an introvert’s battery, it does mine. On especially difficult days, I am barely holding my frustration inside (if I’m even holding it inside) by the end of the day and seriously needing my space. By the time bedtime for the girls comes around I am SO ready. I need bedtime to recharge. Does this sound familiar? Being so ready to have the kids in bed so you can have some time to yourself? Understanding the need to recharge was something that helped me to become a better parent. It also helped me better understand that being an introvert is an amazing thing. Both introverts and extroverts have strengths that they bring into the world and both are needed. The world needs you, introvert parents, and your children especially need your strengths as well. So, embrace your introversion, the ability to think deeply, be creative and love deeply. Yet with embracing the strengths, we also need to understand what may be our weaknesses, such as the irritability and burnout that occurs when we ignore our need to maintain a balance between alone time and raising our family. In order for us to really embrace and use our strengths to benefit our family we need that balance. I am amazed to how much this has been helping me recharge at night. Last night I was pretty overwhelmed with everything that had happened with my girls. It seriously seemed like one thing after another was going on with my girls, they were crying or yelling left and right and it wasn’t just the emotions that were getting to me but the noise level. So after they were finally in bed, my husband gave me some much needed space and I just wrote a couple of blog posts. It was so refreshing. I cannot even express how much better I felt after. Writing about my experiences has also given me a greater understanding of how to help my kids when they go through days such as today. I also enjoy writing fiction. A lot of introverts have amazing imaginations and writing what we imagine is a great way to relax. I’ve enjoyed drawing since I was a child. There is something about it that just relaxes me. Being able to create something with simply a piece of paper and a pencil. It seems simple, yet is also complex. I am not that great at drawing, but I can draw well enough that I appreciate my drawings. I know for others this can also be a great creative outlet. I love colored pencils. I have yet to really discover how to use them in my own drawing, but I have a Disney themed adult coloring book that I love. This is something that works for me, if I’m not working on any other project. If you believe that you don’t have a lot of artistic talent, this is something that doesn’t require too much talent to make a beautiful piece of art. Another thing that coloring helps with is having something to do while watching tv. If you are someone who wants to quit late night snacking, this is a great replacement for snacks while watching tv. My husband is actually the one that does the sculpting but I thought that I would include it on here, because it helps him to recharge. Not only does it help him, but now we have some adorable little sculptures for each of our daughters. It always amazes me how much music can influence my emotions, I love the way it pulls me in as I listen to each note. I am also picky about the words in my music because I really focus on the meaning behind the words as I listen. It is a form of meditation for me when I focus on just listening to music and nothing else. However, when I am with others, I have to turn the music off otherwise it’s too distracting for me. I’m sorry that I have been so focused on the artistic tactics for re-energizing. This one is a little more scientific. Though at the same time it has to do with the beauty of nature, at least that’s what it is for me. This is also something that my husband enjoys. He loves reading the latest news about astronomy and finds it fascinating. He is often unwinding by reading about science and astronomy. Stargazing itself can be done without a telescope, but if you are really into it you can get a telescope. By far one of my favorite things to do. I love reading. And from what I’ve seen online about introverts is that this one is fairly popular, though I doubt that all introverts love reading as much as some of the cartoons about introverts that I’ve seen show. I, however, am one of those introverts who love reading that much. J It is a great way to relax and forget about all the crazy things that may have happened during the day. I also just love the way reading can transport you to a different world altogether. The most recent books that I’ve read are the Mistborn Trilogy by Brandon Sanderson . I enjoyed the books particularly because one of the main characters is an introvert and also there are correlations with high sensitivity and the magic system Sanderson has created. Whether it be writing or photography, learning about a passion for me is rejuvenating. It gets my mind off of whatever troubles I'm experiencing and helps me develop my mind in other ways that I don't use as much throughout the day. While it may still be stimulating, it is not stimulating in the ways that deplete me. You’ll notice that I did not include tv anywhere on here. For me, tv is a way that my husband and I wind down at the end of the day, but at the same time it is more of a distraction. It doesn’t re-energize me in the same way that creating something does. Therefore I left it off. But, for some bingeing on tv shows or movies helps them to get the much needed alone time. 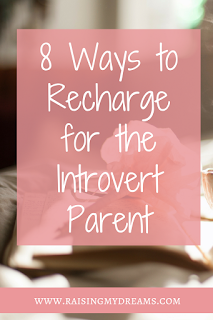 I hope that I gave you some great ideas that might help you to unwind and recharge your batteries after a long day of parenting. As parents, we spend so much of our day taking care of our little ones and we really need take some time each day to recharge. I find that when I have this much needed time, I can then focus more on using my strengths to benefit my family.